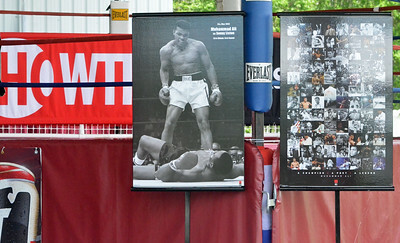 KYLE MENNIG - ONEIDA DAILY DISPATCH A tribute to Muhammad Ali is set up near the Madison Square Garden ring for the International Boxing Hall of Fame's Induction Weekend in Canastota on Thursday, June 9, 2016. 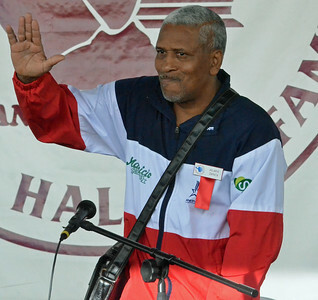 KYLE MENNIG - ONEIDA DAILY DISPATCH Hilario Zapata gestures to the crowd before ringing the opening bell during the International Boxing Hall of Fame's Induction Weekend in Canastota on Thursday, June 9, 2016. 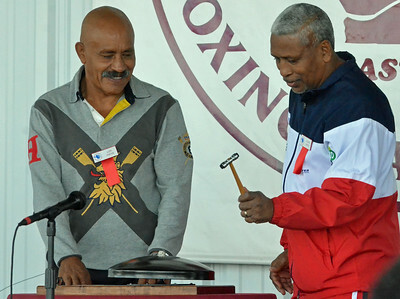 KYLE MENNIG - ONEIDA DAILY DISPATCH Class of 2016 members Lupe Pintor, left, and Hilario Zapata ring the opening bell at the International Boxing Hall of Fame's Induction Weekend in Canastota on Thursday, June 9, 2016. 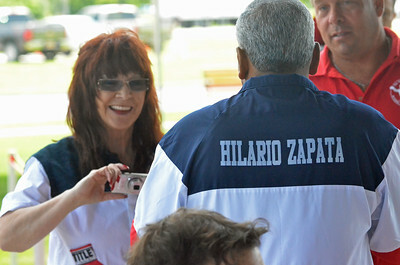 KYLE MENNIG - ONEIDA DAILY DISPATCH Lupe Pintor greets a fan during the International Boxing Hall of Fame's Induction Weekend in Canastota on Thursday, June 9, 2016. 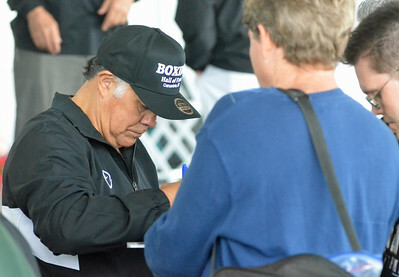 KYLE MENNIG - ONEIDA DAILY DISPATCH Lupe Pintor signs an autograph during the International Boxing Hall of Fame's Induction Weekend in Canastota on Thursday, June 9, 2016. 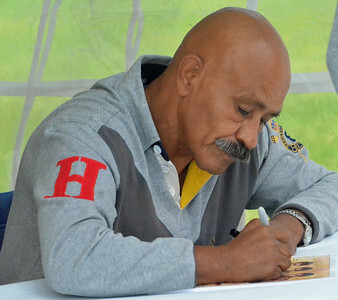 KYLE MENNIG - ONEIDA DAILY DISPATCH Pipino Cuevas signs an autograph during the International Boxing Hall of Fame's Induction Weekend in Canastota on Thursday, June 9, 2016. 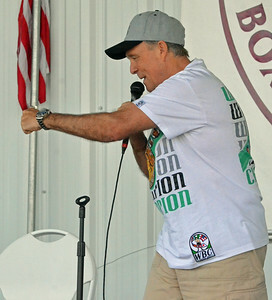 KYLE MENNIG - ONEIDA DAILY DISPATCH John H. Steacey gestures during his ringside lecture during the International Boxing Hall of Fame's Induction Weekend in Canastota on Thursday, June 9, 2016. KYLE MENNIG - ONEIDA DAILY DISPATCH Hilario Zapata poses for a picture during the International Boxing Hall of Fame's Induction Weekend in Canastota on Thursday, June 9, 2016. 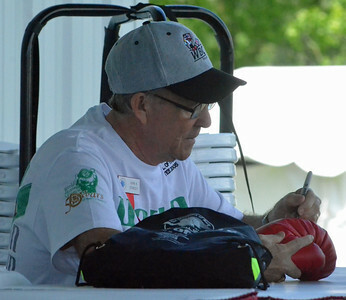 KYLE MENNIG - ONEIDA DAILY DISPATCH John H. Stracey signs an autograph after his ringside lecture during the International Boxing Hall of Fame's Induction Weekend in Canastota on Thursday, June 9, 2016. 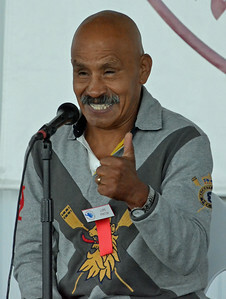 KYLE MENNIG - ONEIDA DAILY DISPATCH Lupe Pintor gestures to the crowd before his ringside lecture during the International Boxing Hall of Fame's Induction Weekend in Canastota on Thursday, June 9, 2016. KYLE MENNIG - ONEIDA DAILY DISPATCH Boxing fans talk during the International Boxing Hall of Fame's Induction Weekend in Canastota on Thursday, June 9, 2016. 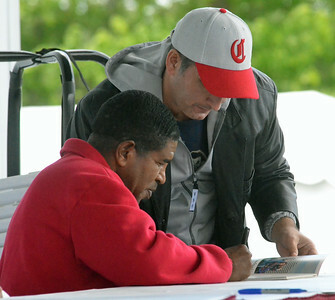 KYLE MENNIG - ONEIDA DAILY DISPATCH Paul Gonzales, right, signs an autograph during the International Boxing Hall of Fame's Induction Weekend in Canastota on Thursday, June 9, 2016. 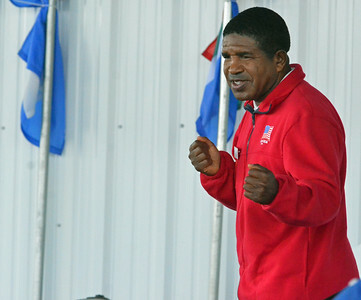 KYLE MENNIG - ONEIDA DAILY DISPATCH Leo Randolph gives a ringside lecture during the International Boxing Hall of Fame's Induction Weekend in Canastota on Thursday, June 9, 2016. KYLE MENNIG - ONEIDA DAILY DISPATCH Leo Randolph poses for a picture after his ringside lecture during the International Boxing Hall of Fame's Induction Weekend in Canastota on Thursday, June 9, 2016. 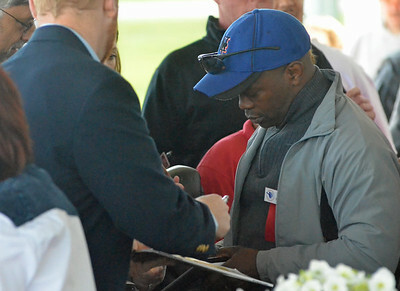 KYLE MENNIG - ONEIDA DAILY DISPATCH Leo Randolph signs an autograph after his ringside lecture during the International Boxing Hall of Fame's Induction Weekend in Canastota on Thursday, June 9, 2016. 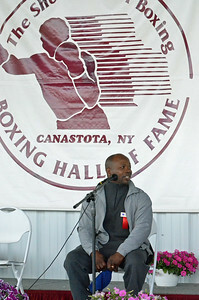 KYLE MENNIG - ONEIDA DAILY DISPATCH Tracy Harris Patterson gives a ringside lecture during the International Boxing Hall of Fame's Induction Weekend in Canastota on Thursday, June 9, 2016. 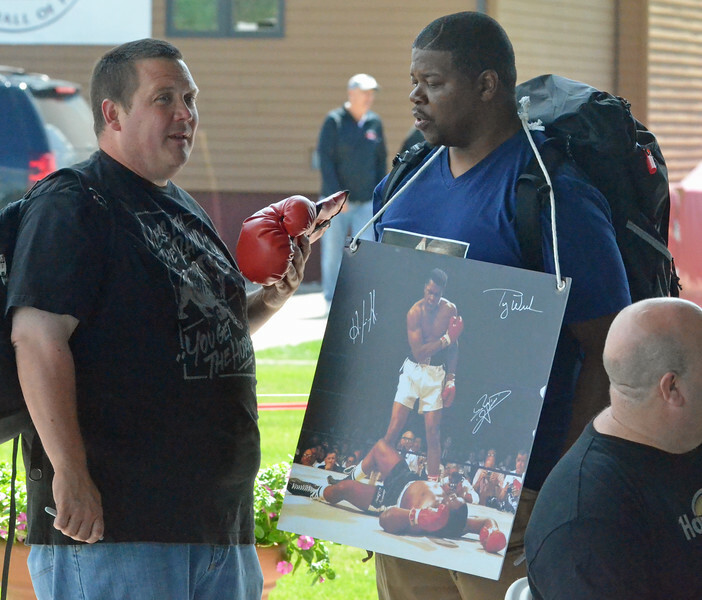 KYLE MENNIG - ONEIDA DAILY DISPATCH Tracy Harris Patterson signs an autograph after his ringside lecture during the International Boxing Hall of Fame's Induction Weekend in Canastota on Thursday, June 9, 2016. 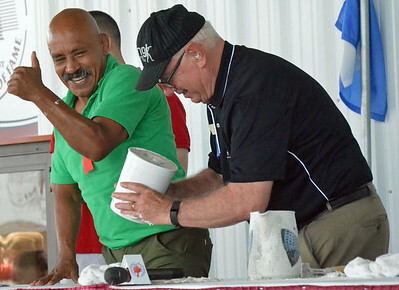 KYLE MENNIG - ONEIDA DAILY DISPATCH Hilario Zapata has the mold for his fist casting made during the International Boxing Hall of Fame's Induction Weekend in Canastota on Friday, June 10, 2016. 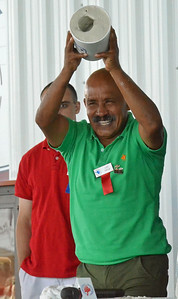 KYLE MENNIG - ONEIDA DAILY DISPATCH Hilario Zapata holds up the mold for his fist casting during the International Boxing Hall of Fame's Induction Weekend in Canastota on Friday, June 10, 2016. 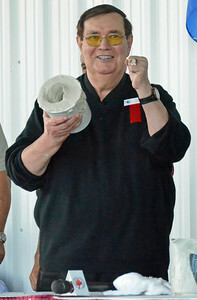 KYLE MENNIG - ONEIDA DAILY DISPATCH Bob Sheridan holds up the mold for his fist casting during the International Boxing Hall of Fame's Induction Weekend in Canastota on Friday, June 10, 2016. 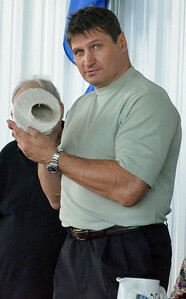 KYLE MENNIG - ONEIDA DAILY DISPATCH Andrew Golota holds up the mold for his fist casting during the International Boxing Hall of Fame's Induction Weekend in Canastota on Friday, June 10, 2016. 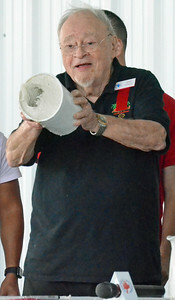 KYLE MENNIG - ONEIDA DAILY DISPATCH Jerry Izenberg holds up the mold for his fist casting during the International Boxing Hall of Fame's Induction Weekend in Canastota on Friday, June 10, 2016. 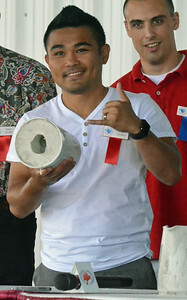 KYLE MENNIG - ONEIDA DAILY DISPATCH Brian Viloria holds up the mold for his fist casting during the International Boxing Hall of Fame's Induction Weekend in Canastota on Friday, June 10, 2016. 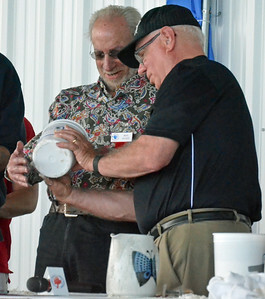 KYLE MENNIG - ONEIDA DAILY DISPATCH John Hunt, right, shows Marc Ratnor the mold for his fist casting as Marvin Camel reacts during the International Boxing Hall of Fame's Induction Weekend in Canastota on Friday, June 10, 2016. 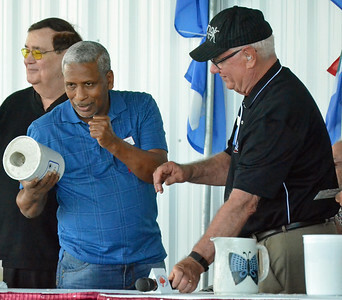 KYLE MENNIG - ONEIDA DAILY DISPATCH Marc Ratnor, right, holds up the mold for his fist casting as Marvin Camel reacts during the International Boxing Hall of Fame's Induction Weekend in Canastota on Friday, June 10, 2016. 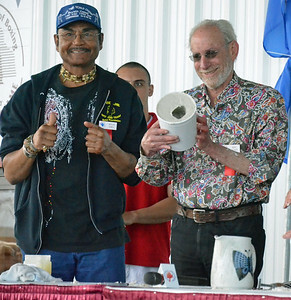 KYLE MENNIG - ONEIDA DAILY DISPATCH Marvin Camel holds up the mold for his fist casting during the International Boxing Hall of Fame's Induction Weekend in Canastota on Friday, June 10, 2016. 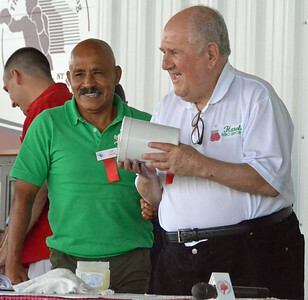 KYLE MENNIG - ONEIDA DAILY DISPATCH Harold Lederman, right, holds up the mold for his fist casting as Lupe Pintor looks on during the International Boxing Hall of Fame's Induction Weekend in Canastota on Friday, June 10, 2016. 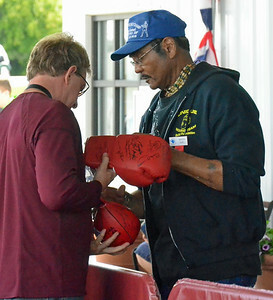 KYLE MENNIG - ONEIDA DAILY DISPATCH Marvin Camel signs autographs during the International Boxing Hall of Fame's Induction Weekend in Canastota on Friday, June 10, 2016. KYLE MENNIG - ONEIDA DAILY DISPATCH Lupe Pintor pulls his fist our of the mold for his fist casting during the International Boxing Hall of Fame's Induction Weekend in Canastota on Friday, June 10, 2016. 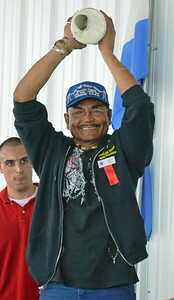 KYLE MENNIG - ONEIDA DAILY DISPATCH Lupe Pintor holds up the mold for his fist casting during the International Boxing Hall of Fame's Induction Weekend in Canastota on Friday, June 10, 2016. 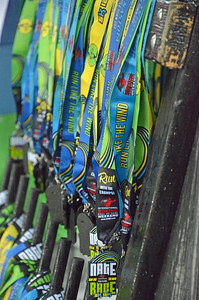 KYLE MENNIG - ONEIDA DAILY DISPATCH Medals for runners of the Nate the Great Title Town 5k Run in Canastota on Saturday, June 11, 2016. 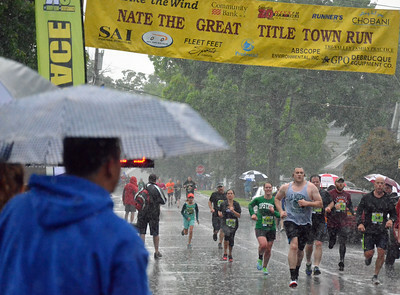 KYLE MENNIG - ONEIDA DAILY DISPATCH Runners leave the start line of the Nate the Great Title Town 5k and 12k Runs in Canastota on Saturday, June 11, 2016. 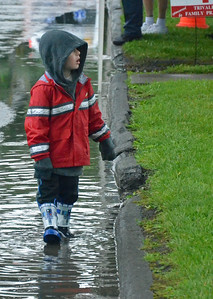 KYLE MENNIG - ONEIDA DAILY DISPATCH A child plays in a puddle near the finish line of the Nate the Great Title Town 5k Run in Canastota on Saturday, June 11, 2016. 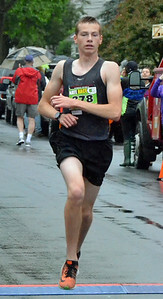 KYLE MENNIG - ONEIDA DAILY DISPATCH Adam VanValkenburgh, 17, of Canastota crosses the finish line to win the Nate the Great Title Town 5k Run in Canastota on Saturday, June 11, 2016. 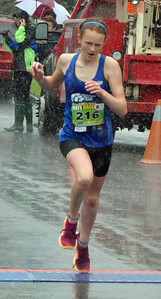 KYLE MENNIG - ONEIDA DAILY DISPATCH Elizabeth Lucason, 12, of Camden crosses the finish line of the Nate the Great Title Town 5k Run in Canastota on Saturday, June 11, 2016. 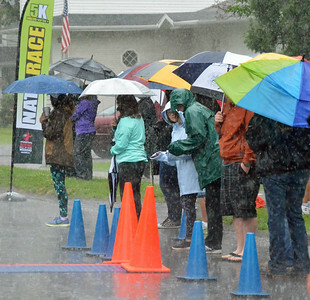 KYLE MENNIG - ONEIDA DAILY DISPATCH Spectators watch runners cross the finish line of the Nate the Great Title Town 5k Run in Canastota on Saturday, June 11, 2016. KYLE MENNIG - ONEIDA DAILY DISPATCH Runners cross the finish line of the Nate the Great Title Town 5k Run in Canastota on Saturday, June 11, 2016. 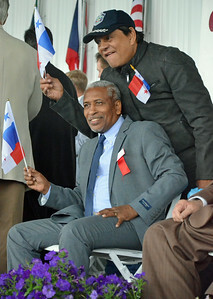 KYLE MENNIG - ONEIDA DAILY DISPATCH Roberto Duran, right, and Class of 2016 inductee Hilario Zapata pose for a picture during the induction ceremony at the International Boxing Hall of Fame on Sunday, June 13, 2016. 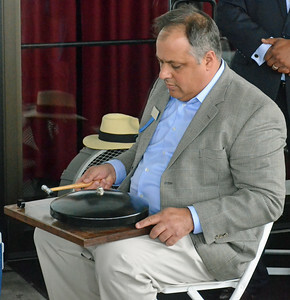 KYLE MENNIG - ONEIDA DAILY DISPATCH Angelo Testani rings the bell during an honorary 10-count for Muhammad Ali and Bob Foster during the induction ceremony at the International Boxing Hall of Fame on Sunday, June 13, 2016. 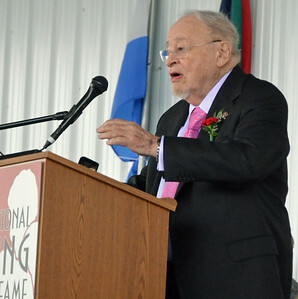 KYLE MENNIG - ONEIDA DAILY DISPATCH Class of 2016 inductee Jerry Izenberg gives his induction speech at the International Boxing Hall of Fame on Sunday, June 13, 2016. 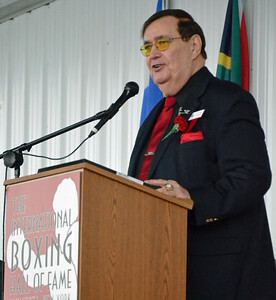 KYLE MENNIG - ONEIDA DAILY DISPATCH Class of 2016 inductee Col. Bob Sheridan gives his induction speech at the International Boxing Hall of Fame on Sunday, June 13, 2016. 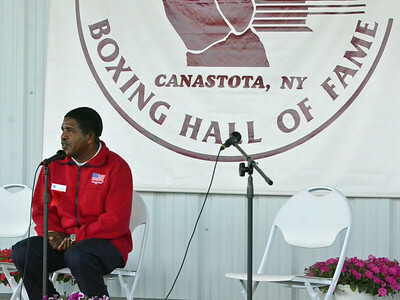 Boxing fans talk during the International Boxing Hall of Fame's Induction Weekend in Canastota on Thursday, June 9, 2016.